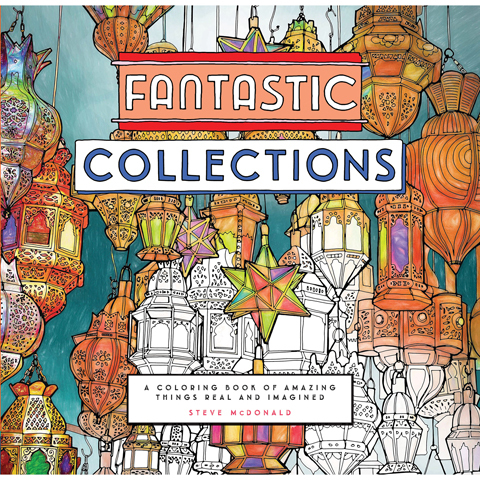 In this coloring book by the author of the internationally bestselling Fantastic Cities, artist Steve McDonald uses his unique photo-based approach to create beautiful and intimately detailed line drawings of amazing collections of objects. Finding inspiration in the unusual (museum collections, antiques and quirky toys) and the everyday (leaves, butterflies, vintage cameras and store product displays), McDonald creates playful and immersive illustrations that are as lovely as they are fun to color. The quality of the large, crisp white pages are conducive to a range of applications, while a middle margin keeps all the artwork fully colorable. A dozen meditative mandalas created from the drawings round out this gorgeous adult coloring book.